Eriospermum flagelliforme belongs to the Eriospermaceae family. These and other species in this family are found in a large part of Eastern Africa such as Zimbabwe and Malawi, but also up to northern Ethiopia. This bulbous tuber with somewhat grassy leaves is found on grassy terrains. 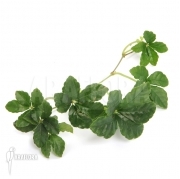 The plant grows naturally in poor sandy soil and is often found in hollows between rocks. 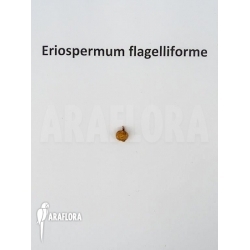 Eriospermum flagelliforme is a perennial herb growing from tubers. It dies above ground in dry periods and growth starts again when it is humid enough. Many plants in the Southern Hemisphere flower there when it is winter here, but here most species follow our seasons and then bloom in the spring or summer. The yellow flowers in a thin spike usually appear in the winter, but sometimes also in other periods. The flowers appear first and then the leaves appear. We don’t have much growing experience with this rare plant yet. Plant the bulbs just under the soil, in poor potting soil, consisting of ¼ masonry sand. Give little water in the beginning and once the growth has begun you can give more water. In the summer months they can be placed outdoors in a warm place, but keep them in pots. Dry in the winter and at least 10°C. As soon buds show, increase watering slightly. At present they are very rare in the trade, so we are very pleased that we can now offer them for sale.